The route goes from Delft to the end of the Maas Tunnel in Rotterdam and follows the Schie Canal. The route is about 14.7 kilometers (9.1 miles) long and can be divided into five segments (see map below). Section A is in Delft which consists primarily of cycle tracks along Rotterdamseweg and Delftweg. At some times, this portion of the route turned into advisory lanes along the country roads. Section B goes through the village Overschie and is primarily mixed use. Section C is a completely separated path along the canal. Section D follows main roads in the main city of Rotterdam, and Section E runs through the Maas Tunnel. To see images of each section, click on the marker with the corresponding section number. The bike highway was relatively easy to follow, except for the one portion of the highway through the village Overschie where the left turn you needed to make was not clearly marked. In addition, the entrance to the Maas Tunnel was through a building, which is slightly confusing because for typical car tunnels, the portal is connected to the road the driver was traveling on. Although there was a sign pointing to the building for the Maas Tunnel, it was not immediately clear that going through the building and down the escalator would bring you to the tunnel. 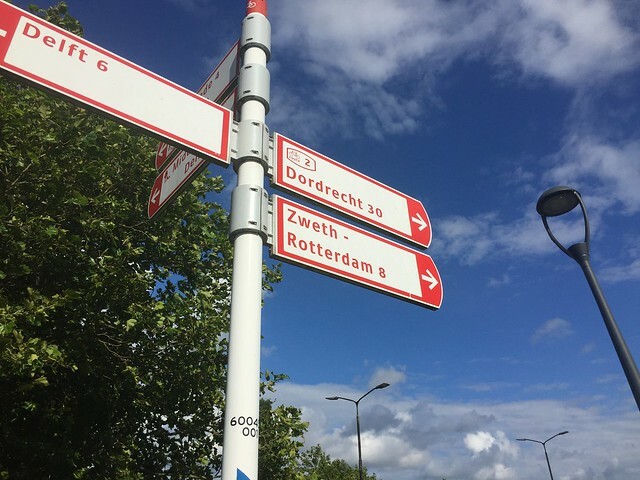 Other than these two instances, signs clearly pointed in the direction of either Delft or Rotterdam, as well as other destinations in the network. Figure 1: Way-finding sign that points in the direction of cities and gives the distance (in kilometers) to them. The route is very direct, since it follows the main canal from Delft to Rotterdam. It also runs parallel to the A13 highway, the main mode of travel for drivers from Delft to Rotterdam. The route also is very easy to follow in both directions, since parts of the route were either two way cycle tracks, or one-way advisory lanes on both sides of the road that connected nicely to the two-way cycle track. The bike highway overcomes barriers such as major motorways by creating overpasses for the bike path to continue beneath so that cyclists can continue along the highway with limited stops. Water barriers are overcome by building bike bridges over them, such as the small bridge where you enter Rotterdam. The major water barrier, the river Nieuwe Maas, was overcome by the bike and pedestrian tunnel under the river built parallel to the tunnel drivers use. However, cyclists must dismount and bring their bike down via the elevator or escalator, which is slightly inconvenient. To overcome rough pavement, cyclists ride on separate cycle tracks for most of the route. The bike highway solves the issue of riding along stressful roads by creating separated cycle tracks for most of the ride. These cycle tracks ride along rural roads, except for Section C, the a stand-alone cycle track, which is the most comfortable portion to ride along despite its short width. The only portion that did not have separate bike infrastructure was Section B, the portion through the village Overschie. Through the village, cars and bikes are in mixed traffic and is the most uncomfortable portion of the bike highway to ride along. Although the passage through the village is the most direct route along the canal, it would be better if there was separate bike infrastructure to accommodate cyclists using this route. Overall, the ride was very enjoyable because for about 90% of the time the ride was along scenic country roads with little traffic. The cycle tracks and separated paths made it very unstressful to ride the bike highway from Delft to Rotterdam. The route was very direct, as it followed one of the main canals to Rotterdam. It was also interesting to see a tunnel built specifically for cyclists and pedestrians to cross the river. 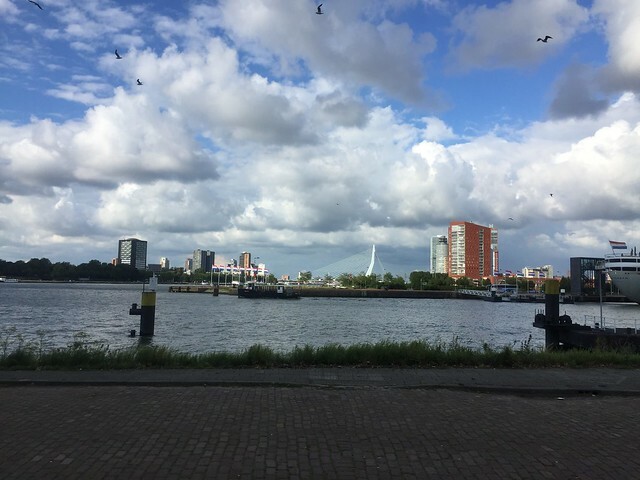 The most enjoyable part of the ride was on the Rotterdam side of the Maas Tunnel where you could look at a nice view of Rotterdam and the Erasmusbrug Bridge (Figure 2). Figure 2: View of Rotterdam from the Rotterdam side of the Maas Tunnel.